Your end-users can use the information in the knowledge base or turn to the community (if enabled) for answers. If they can't find an answer, they can submit a request to an agent. Agents can use the knowledge base to help solve tickets faster. With Guide you can manage your content and deliver it in multiple languages in Help Center. You can customize the look and feel of your Help Center and decide which features to include. Tip: If you want to learn more about reducing the load on your agents by building a Help Center, check out the Self Service: Setting and Customizing Guide training course. The Help Center consists of a knowledge base and a community platform. Use the knowledge base for the official content provided by your company or organization. The Help Center consists of categories, sections, and articles. On Guide Enterprise, you can add subsections to your knowledge base to create more levels (see Adding subsections to create more levels in your Help Center). Categories are the top-level organizing containers of the Help Center. Categories contain sections. The Help Center must have at least one category. If you have only one category in your Help Center, then the category itself is hidden to end-users, and they see only the sections in your Help Center. Note: A category must have at least one section visible. A section will not be visible until an article is added. Sections contain related articles. On Guide Enterprise, sections can also contain subsections. To add a section, you must have at least one category to act as its parent container. On Guide Lite and Professional, each section must be child of a category. On Guide Enterprise, a section can be a child of a category or a section. Articles are content items such as tech notes or help topics. The community is where you can create and comment on posts to pose questions, provide answers, or share ideas. Community is available on Guide Professional and Enterprise. Most posts are associated with discussion topics. Community posts can include ideas, tips, or any other community items. Answers can include observations, clarifications, praise, or any other response that's part of a typical community discussion. The Help Center is not deployed by default. You must enable it in setup mode, prepare it for release, and then activate it. When Help Center is in setup mode, it is hidden from end-users and is visible to administrators and agents only. Note: If you have set up multiple brands, and want to add a Help Center for a brand other than your default brand, see Creating a Help Center for one of your brands. Sign in to Zendesk Support as an administrator. 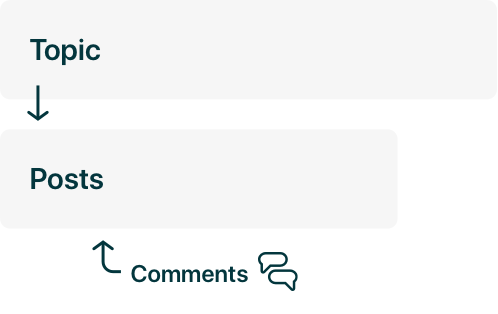 Click the Zendesk Products icon ( ) in the top bar, then select Guide. In the page that appears, click Build your knowledge base. Your Help Center is created using the default theme. You can customize the theme and add content while it's in setup mode. For next steps, see Preparing your Help Center for release. While your Help Center is in setup mode, you can prepare it for release. During this time, end-users cannot view your Help Center. These are some of the steps you can take to prepare your Help Center. Tip: Developers can use a REST API to insert, update, and manage content in Help Center. See the Help Center API documentation. For help on getting started, see Zendesk developer docs and resources. Do some planning for how your will build and launch your Help Center (see Lisa Painter's Fine tuning: "Blueprinting" your Help Center). Be sure to check out Pinterest page of beautiful Help Centers for inspiration. Adjust the look and feel of the Help Center in setup mode. Brand your Help Center by adding your product logo and your brand's colors and web fonts (see Branding your Help Center). Customize your Help Center. If you're a web designer or a web-savvy administrator, you can make more extensive customizations by editing the page code (see Customizing your Help Center theme). Also, check out the Help Center tips from our community. Only agents and administrators can access the Help Center while it's in setup mode. To see what your Help Center looks like to end-users or anonymous users, see Previewing your Help Center. Be sure to test in different browsers. See the list of browsers supported by Help Center. Set the display name for your Help Center. The display name can be the same as your subdomain or different. The name appears in the footer of the standard Copenhagen theme (see Changing the name of your Help Center). Ensure that your default language is properly set for your Help Center. It is important to set your default language before you add any articles to your Help Center, as the source locale for your articles defaults to your default Help Center language. A mismatch between the default language and the language you select for your articles could cause your content to not appear. Your Help Center default language is initially determined by the default language setting for your account in the Support admin (see Configuring the default language for your Help Center). Add your content to the Help Center. Migrate content from an existing knowledge base or community, if you want (see Migrating existing content to Help Center). Create knowledge base categories and sections (see Organizing your Help Center knowledge base content in categories and sections). If you migrated content from another system, you won't need to create categories and sections, unless you want to add any. Add articles (see Working with articles in the knowledge base). If you're starting from scratch, check out Best practices: Finding issues to populate your knowledge base. If you need an easy way to back up your knowledge base articles, check out the kBackups app in our community. Create user segments to restrict access to content as you'd like (see Creating user segments to restrict Help Center access). Create community discussion topics (see Managing Help Center community discussion topics). If you don't want community, you can disable it (see Disabling your Help Center community). Note: Community is available during the Guide trial and if you purchase Guide Professional or Enterprise. Community is not available on Guide Lite. (Support Professional or Enterprise and Guide Professional or Enterprise) Set up your Help Center to support multiple languages. Enable languages for your Help Center (see Configuring your Help Center to support multiple languages). Create localized versions of your Help Center content (see Localizing the Help Center). Note: Multiple languages are available if you have Support Professional or Enterprise and Guide Professional or Enterprise, either during the Guide trial or as a purchased plan type. Add any Guide Managers (see Understanding Guide roles and setting permissions). When you are ready to go live, you can activate your Help Center. When you're ready, you can activate your Help Center and make it live for end-users. You must be a Zendesk Support administrator to enable Help Center. Guide Managers who are not Support administrators cannot enable Help Center. Tip: Check out Phil Hansen's Fine Tuning: Best practices for ticket deflection for tips on how to best promote self-service during your Help Center launch. In Guide settings, click the Activate button. Click Activate again to confirm that you want to activate your Help Center. Click Enable spam filter or Don't enable spam filter (see Using the spam filter to prevent Help Center spam). Your Help Center is activated and is now visible to end-users. If you need to deactivate your Help Center, see Deactivating your Help Center. Next steps: Be sure to check out Help Center guide for end-users and also our complete list of Help Center resources. I want to have a big button on the landing page of help center that says submit request. How do i accomplish this? I'm not able to walk you through exactly how to do this, but hopefully one of the CSS gurus that hangs out here can help you out! In the meantime, feel free to check out our documentation on how to customize your Help Center with CSS: Help Center CSS Cookbook. Our support tickets are integrated into our application. When a user selects support, the ticket includes the URL for the exact place in the application. Support is enabled to select the link in the ticket and see exactly what the user is seeing. We want to bring the KB/HC to the foreground in support. We have discussed moving the ticket to the KB/HC yet do not know of a way to link the URL with a ticket launched from the KB/HC instead of from with our application. Is it possible? Any ideas? It looks like you've reached the wrong company! Zendesk makes software for other companies to organize their customer support processes. We provide the software to them, but we don't support the products or services they provide to you. I'm afraid I don't know who you're trying to reach, but I hope you're able to get in touch with them soon! I'm going in circles trying to understand why I'm seeing different categories when previewing as manager role than I do when I preview as end-user. I want the same categories to appear in both cases. Can anybody kindly help? 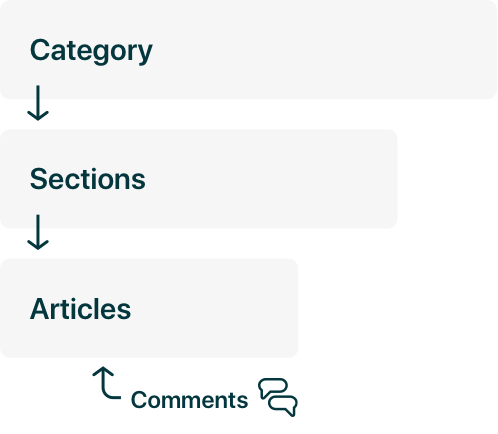 Categories, with no sections or articles, are not visible to end-users and anonymous users whereas managers and agent can see all the categories with or without sections or articles. I realize that is the way it is supposed to work but I have articles within all sections and those sections all within categories. While previewing the home page, end-user seems only to be able to see a random selection of sections whereas managers seem to see only the categories and no sections. Any suggestions? @Brian, Make sure that your categories and articles are published and are not in draft mode in order to make them visible to end users. We do not want a help center, but need to have one so users can see their Zendesk Support tickets. Quite a strange setup. The guide theme is not suitable for that, we need to modify the theme to direct people to the tickets, but thats only using a paid plan for Guide. so its a very strange and not very good setup you have here, forcing people to have Guide so end-users can see their Support tickets whether we need Guide or not. Why can't I go full screen when adding an article on Zendesk Guide? When writing a new article, there is such little space for the editor on the screen with the side bar and top bar. There must be a way to get more space on the screen to write without so much clutter. What am I missing? @Arpit Choudhury I'm afraid there isn't a way to remove the toolbar located at the top of the page and sidebar when editing/creating an article within Guide. While full-screen mode is not an existing feature, I do think this is a fantastic idea worth mentioning in our Product Feedback Forum for our Product Managers to take a look at! Hi! I'm trying to learn how to use Guide and what happens when we activate it. I want to know more in detail how our end users get access to our Help Center. You write in your article about Activating Help Center: "our Help Center is activated and is now visible to end-users". But WHERE do they see it? Do we publish an URL to our Help Center at our website or what? At the moment we are not using customer sign-in. Just Support and Talk. You are right. You need put the URL of your HelpCenter somewhere on your website so that your end users can see your HelpCenter. We have separate products that we manage support for within our ZenDesk portal, would it be possible to have separate help centers for each product? @James - In order to have multi brand support then you would need to be on the Enterprise plan or higher. This would allow you to have separate Help Centers for each of your products. Thanks for jumping in Wes! James you can find more information in our Creating a Help Center for one of your brands article. We created our Help Center with Categories, Sections, and Articles. If we put the URL of the Help Center somewhere on our website, does that mean that everyone will be able to see the content and organization (Categories, Sections, Articles) even if they're not signed in? That would depend on how you've set up your articles when creating your content. When creating your articles you should have seen a Visible to drop-down where you can select signed-in users. If these articles are restricted then when the users selects the Help Center URL from your website they will not see this information until after they've signed in. More information in our Creating and editing articles in the knowledge base article which I've linked for you. The lede for this article states that it will tell me how to set up Guide as a "Customer portal, where customers submit tickets and, on Guide Professional and Enterprise, also manage their tickets." This is exactly what I need. But this setup guide is entirely focused on a knowledge base, which I care nothing about for my clients. How can I set up Guide to show my clients their own tickets? To show clients their own tickets they would need to do so through the Help Center which comes with the knowledge base. After your client logs into the Help Center they can select their profile picture towards the top right and choose My Activities. This will take them to a separate page where they can see a list of any tickets they submitted. More information in the following article: Submitting and tracking requests in the Help Center Customer Portal (Guide Professional and Enterprise). I was also able to track down a Support tip that goes over Setting up a requests-only (tickets-only) Help Center (Guide Professional and Enterprise) which I believe you'll find useful. @Brett--The "Setting up a requests-only Help Center" article was exactly what I needed. Thanks for the pointer!